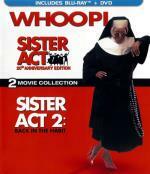 To commemorate the 20th anniversary of a comedy classic that packed pews everywhere, Disney proudly presents a special 2-movie collection, featuring Sister Act and Sister Act 2: Back In The Habit, for the first time ever on Blu-ray! Academy Award® winner Whoopi Goldberg (Best Actress In A Supporting Role, Ghost 1990) stars as a sassy lounge singer forced to hide from the mob in the last place anyone would ever look for her – a convent – where her fun-loving attitude turns the nuns' tone-deaf choir into a soulful chorus of swingin' singin' sisters. In the sidesplitting sequel, Whoopi is back for another hilarious adventure as Sister Mary Clarence spreads the gift of music and the power of laughter at an inner-city school. Harvey Keitel and Kathy Najimy join a heavenly cast in these habit-forming comedies busting with '60s Motown hits. Relive all the fun and irresistible music of both movies with a stunning state-of-the-art digital restoration! This is one I haven't seen since the '90s... I feel it held up well. I enjoyed it quite a bit. This one has quite a but if laughs. I am glad I finally added it to my collection. The boy quickly learns the true nature of the house's homicidal inhabitants and the secret creautres hidden deep within the house. Starring Everett McGill (Twin Peaks, Dune), Wendy Robie (Twin Peaks), Brandon Adams (The Mighty Ducks), Ving Rhames (Piranha 3D, Mission: Impossible), A.J. 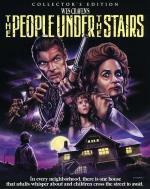 Langer (Escape From L.A.) and Sean Whalen (Rob Zombie's Halloween II, Hatchet III), The People Under The Stairs will grab you when you least expect it... and never let go. This is the first time I watched this movie in quite a while. This is a bit of a weird movie, I grant you... but it is one that I enjoyed quite a bit. The couple in this movie is so over the top it isn't even funny. But it is entertaining to say the least. I really liked the kid that played the 13yr old boy nicknamed Fool that takes on this strange and sadistic couple to save his family... and then going back to save the other kids he met that the couple has trapped in the house. This is not what I would call a gory movie... but some of the things seen here is a bit on the bloody side. Not to mention things a little hard to look at... like "Daddy" in full leather fetish gear trying to hunt down Fool. Over-all it is a movie I enjoyed quite a bit. Glad I finally got around to watching it again. This blu-ray release makes for a nice upgrade... especially considering there was no extras what so ever on the DVD release. When top scientists simultaneously die in separate automobile accidents, fiendish alien visitors invade their bodies. The aliens, using their own knowledge and the scientists intellect, devise a diabolical, world threatening plot to resurrect great monsters including Frankenstein, The Mummy, Dracula and The Werewolf for the building of a vicious army to conquer the human race. Suspense mounts when the conspiracy goes awry as the monsters turn their evil action against each other. Failure comes fast and furious as the alien empire explodes in total devastation bringing an end to this terrifying science fiction thriller. Not that I am really surprised, But this one had trouble keeping my attention. Story is lacking... I really didn't care about any of the characters... and some of the film was so dark I couldn't make out what was going on. The one thing it has going for it is that it is a short film. The quality of the DVD is lacking as well. Felt like I was watching a cheap VHS tape.